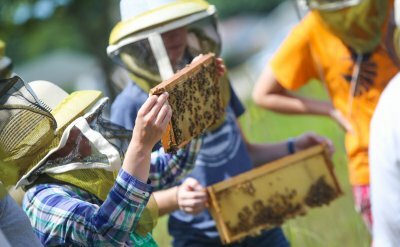 This 13-week fall semester program is for students who want to explore many ways to contribute to sustainable, resilient futures for our communities in the midst of our rapidly changing planet. It is ideal for those who want to learn skills and mindsets that they can use as they become leaders in their careers and everyday lives. In the SLS, we explore the sustainability of places in multiple ways, canoeing 70 miles from the top of the watershed at Merry Lea to Lake Michigan, hiking trails, biking, and interacting with a variety of community members and sustainability professionals. We also read widely, connecting with insights and ideas from diverse disciplines and perspectives. Through the SLS, students dig into personal leadership development, clarifying their unique strengths and working together with others to catalyze growth. Students also consider how to influence the holistic health of communities as they experience many aspects of the systems our society relies on. We discover how to use our values and ethics to impact climate change, ecological degradation, and other sustainability challenges the earth is facing. 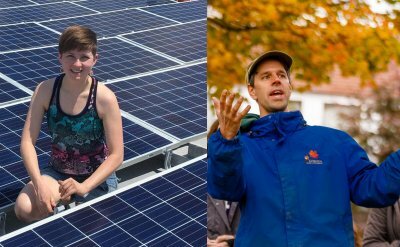 The SLS is an integral part of the Sustainability Studies major and the Sustainability minor, but is open to all majors and students from other colleges seeking to transfer credits or gain a certificate. Watch this video to learn more about the Sustainability Leadership Semester. SLS has a strong focus on building and maintaining healthy communities. Students interact intensively with each other, a team of faculty, and community members to wrestle with the complex and interdisciplinary nature of the issues and possible steps toward positive change. This learning community provides an opportunity for students and faculty from a wide range of backgrounds and expertise to contribute. This is a crucial component of the SLS, because the hope of a sustainable future lies in our ability to communicate and cooperate with all stakeholders in a given issue. Our aim is to equip students with that ability. As if that all weren’t enough, SLS students get to spend the semester living in Indiana’s first LEED Platinum set of buildings: Rieth Village. Two cottages are available with all the sustainable features one could want: solar panels, solar water heaters, local timber, pervious pavement, ground-source heating and cooling, a wind turbine, an adjacent kitchen garden…and the list goes on. Moreover, Rieth Village is situated on the northeast corner of the Merry Lea Environmental Learning Center’s 1,189-acre property. This affords students with full access to 8 miles of hiking trails through a mosaic of restored native ecosystems, four bodies of water for boating, and ample space for personal recreation or meditation. If you have any doubts about how SLS fits into your personal academic plan, please talk with your academic advisor or contact Joel Pontius for more information. He would be thrilled to field your questions! What are the dates? The Sustainability Leadership Semester takes place during the fall semester of the academic school year. For more information, please visit the application and registration page. What is the deadline for receipt of my completed application? Please visit the application and registration page for this information. Where are the courses delivered? Merry Lea Environmental Learning Center of Goshen College will be your home base for 14 weeks. You’ll live in the cottages at Rieth Village and study in Merry Lea’s classrooms—indoor and outdoor! You’ll visit local organizations and individuals. You’ll canoe Noble County’s navigable rivers. To some extent, all of the Elkhart River Watershed will be your classroom. What do I not need to bring? At Rieth Village, you will be provided with refrigerators, microwaves, pots and pans, cooking utensils, dinnerware, silverware, cleaning supplies, dishwashing supplies, laundry detergent, a bed, a dresser, a desk, and a desk chair. Any further questions can be directed to Tom Hartzell. What is the time expectation? Expect to live a focused life during these 14 weeks. You’ll do plenty of reading and writing, but those hours might also include paddling, interviewing a local farmer, conducting water quality tests, attending a town meeting—or just sitting and watching a muskrat. Extensive time commitments elsewhere are not recommended. Students should plan to be available Monday through Friday throughout the semester as well as the weekends indicated on the calendar. How many credits do I earn? You’ll earn 15 credits for the five courses of the Sustainability Leadership Semester. For more information, please visit the SLS Courses page. How do these courses fit with a plan of study at Goshen College? There are two ways that SLS can contribute to your Goshen College degree programs. One way is for it to be a major portion of the Sustainability Track within the Environmental Science Major. The other is for it to be the large part of a Sustainability Minor in The Sustainability and Environmental Education Department (SEED). One of your courses has to do with faith. What if I am not a Christian? You don’t have to be a microbiologist to benefit from a course in microbiology; neither is it assumed that all members of the cohort will have faith commitments. You do need to be open to learning from people whose faith is central to their thinking and to their responses to environmental degradation. 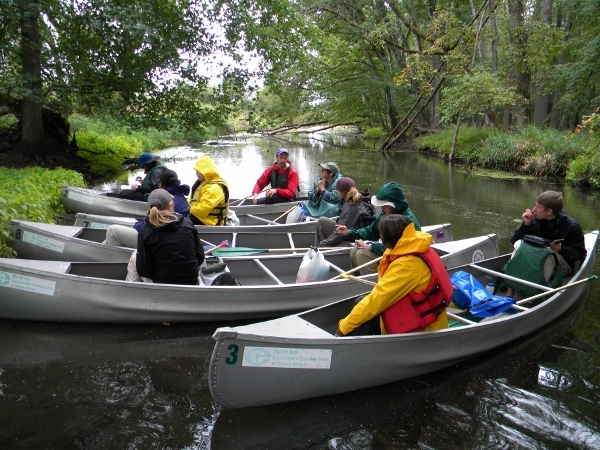 Join us for a 5-week downstream canoe trip that kicks off the holistic study of our watershed. What kind of field trips do you take? We go on field trips that supplement and contextualize the material being learned in class, sometimes via van and sometimes via bicycle. That leads us to a wide variety of sites, and brings a broad swath of guest speakers to our classroom, as well. An education major might come to experiment with the unique pedagogy. A business major should have many reasons to develop a knowledge of sustainability. A religion major might be intrigued by the practical theology and creation care emphasis in the program. A student of social work could broaden his or her understanding of policy and social change. A peace studies major could learn about the conflicts inherent in environmental issues. Are there prerequisites? The program is designed for students with junior (or senior) standing. Sophomores may be accepted on a case-by-case basis. Will this experience give me a minor in sustainability? If you have a major other than environmental science at Goshen College, you can use SLS toward a minor. You will be required to take just one additional course selected from a list of possible on-campus courses to fulfill the requirements for the minor. I don’t attend Goshen College; must I enroll at GC in order to participate? Yes, but only for the semester. Credits are then transferable to your home institution. For more information, please visit the application and registration page. What if I have already graduated from college. Can I still attend? Yes, you can participate in this program and earn a SLS Certificate to enhance your resume. For more information, please visit the application and registration page. Can I take just part of the program? For this program, that’s a little like asking if you can take just a gear or two out of a clock. This is an interdisciplinary, integrated experience. It’s all or nothing. 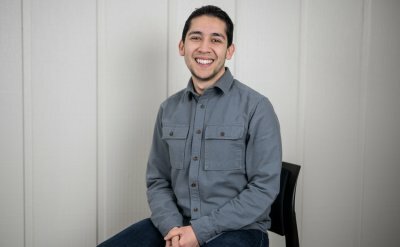 What does the Sustainability Leadership Semester cost? The tuition cost is the same as a full semester on the Goshen College campus. For more information, please visit the tuition and financial aid page. Is room and board included in the cost? Room and board is a separate cost. Students will be required to buy what amounts to a partial meal plan that will cover the cost of the shared meals. Students will be responsible for the cost of purchasing food for the rest of the meals. Fresh vegetables will be available from the greenhouse and kitchen gardens until the growing season ends.For more information, please visit the tuition and financial aid page.